Royal Mail's 'Post and Go News' webpage was silent about the whole event which meant that we had to rely on the IAR website or unpublished information from Royal Mail, or contact with the postal authorities. 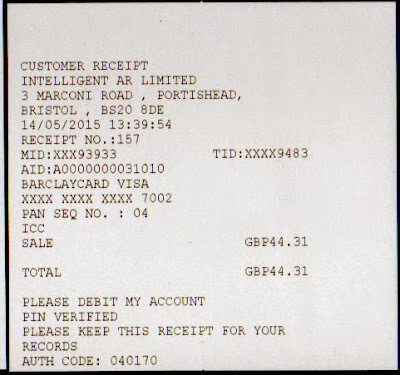 Two days before the event started the IAR site announced that machine A009 would not be at the exhibition, and would be replaced by A004, which would then move on to a new 'to be announced' static location. 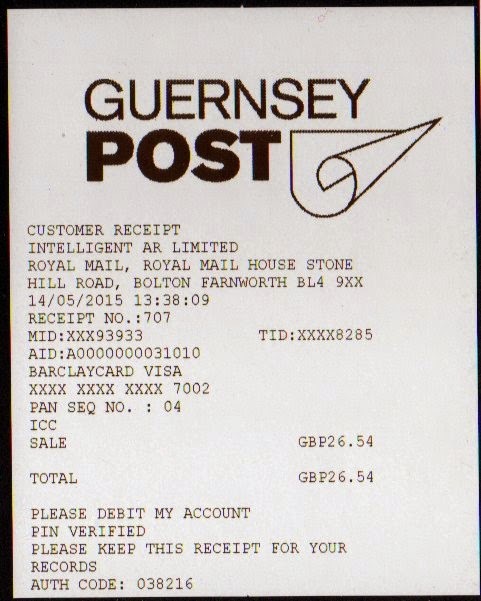 The Royal Gibraltar Postal Service could tell us nothing about the Post and Go stamps - not what would be sold, nor what 'values'. Information from Jersey about the content of their machine varied according to who was asked! EU 20g letter (70p), Worldwide 20g letter (80p), Registration Fee (£3.00). The Guernsey machine GG01 produced their own flag with London 2015 inscription, and Union Flag without. The Royal Mail machines dispensed, variously, Heraldic Beasts, Union Flags, and Machins with a London 2015 inscription. Some Machins with year code MA13 were available on the first day (13th May) but they were replaced with undated Machins which were still in use on 14th. 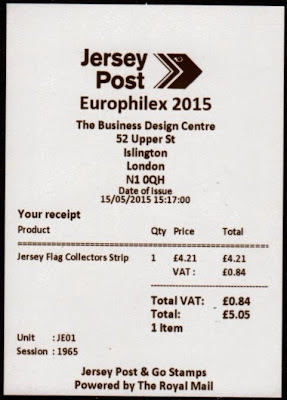 The Jersey machine JE01 dispensed Jersey Flag stamps with the Penny Black 175 inscription, and Protected Species stamps launched at Stampex. 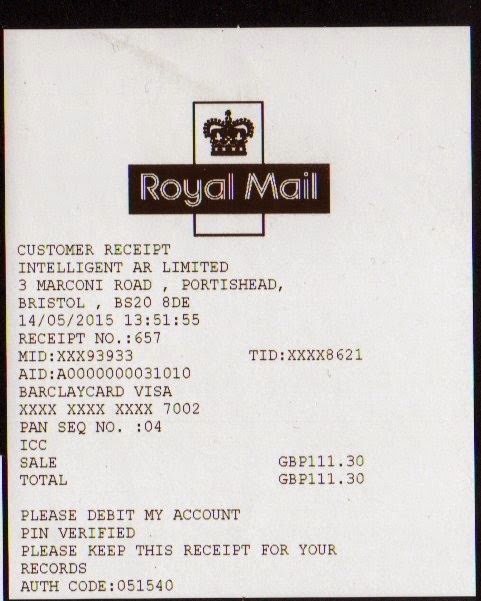 As before the Receipts carry the logo of the postal administration - except that for Gibraltar which is anonymous. Mike reports that his receipt from machine A006 is dated 10/05/15 - going by eBay listings session 586 was incorrect but the error was corrected by session 606 (see receipt above). Robert reports: "As you may know on Wednesday at the start of the Europhliex 2015 on the Gibraltar stand the P&G kiosk was printing a mistake on the Collector Set i.e the "WORLDWIDE up to 20g Value had "WORDWIDE up to 20g - I understand this was fixed later on Wednesday, but as can be seen on the enclosed Photos. This was still happening at 12:52 on Thursday 14th." ... but clearly it had been fixed by the time I bought mine! The inclusion of the registered fee label is a concern, as on its own, it’s not valid for postage, and has to be used in conjunction with one of the other labels. With any luck others in the “club” won’t be repeating this. It’s not as if other rates were not available Local Priority (58p up to 150g) or Spain Priority (40p up to 50g), though inclusion of the Local Priority would mean that two sets of rates changes would occur each year, currently Local Priority changes in May and the rest change in November. A premier European exhibition should not be tainted with such paucity of pre-show information and then basic errors on the day(s). Post & Go has been around for some years now and just about every conceivable error has already been demonstrated. It is about time this was propoerly sorted out to avoid further reputational issues. ... and yes, I am now embarrassed by my spelling mistake (propoerly) above! Ha! Yes, glasshouses and stones; I make plenty in the blog - but I can edit mine, whereas comments cannot be edited. Once again I have been assured that steps are being taken to prevent such errors. And that was before the 2015 and Wordwide errors were reported. So far at least, the “Europhilex London” overprint has only appeared on the Machins and the “Europhilex 2015” has only appeared on the Jersey & Guernsey flags, including those from the respective bureaus. 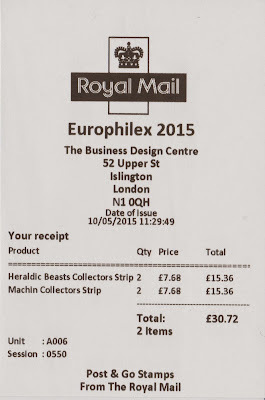 I seriously doubt whether the Machins will appear with 2015 or the islands' stamps with 'London'. Looks like it's time to close the Stockbook on the Post & Go collection, or restrict it to Post Office issues only! With a mixture of lack of quality control at the Stamp Exhibitions and the various museum sites, topped off with the excessive number of issues from Jersey etc it very much looks like the Post & Go semi- official issues will go the way of previous flash in the pan collecting fads with the bubble getting ready to burst! I gave up collecting those produced on the Royal Mail Series 2 machines last year to concentrate on the Wincor & NCR. From talking to others, I’m not alone in that decision, the only RM series 2 ones in my collection come from the packs. I don't think these are a flash in the pan. This is probably going to be the mainstay of stamps bought by the public in future - old sheets of machins behind the counter will surely gradually disappear. I've certainly got annoyed about some of the post and gos being issued like the museum ones (where will it all end?) and the Crewe/Bradford ones although thank goodness that avenue was closed down quickly (hoorah!) I've restricted to overprint differences (including the islands and couldn't help getting Gibraltar at Europhilex which is a departure but they are nice and fit the collection!). I think in future - some way in the future - UK Post Offices will sell P&G type stamps over the counter as they do in Ireland. And they have a multitude of pictorial issues, often in parallel with sheet/booklet stamps in the same series. And then *most* people will collect one of each design, rather than all the individual values. Maybe then SG will provide catalogue entries for the individual designs, rather than values as they have done until now. Not separately listing all the designs in a set with separate numbers is foolish. Talking of bubbles, if there is one I think it will be on the errors and minor difference like serial numbers. There are going to be so many of these - and as these are effectively printed on a single 'computer' there is going to be a massive amount of variations. It's so unlike conventional stamps where they were centrally produced under 'quality control'. Given the change in emphasis from domestic exhibitions/fairs to overseas ones, I wonder what collectors feel about the comedy of errors we have been subjected to. Has the change of policy anything to do with declining demand from domestic collectors? A perusal of internet auction sites suggest that there are fewer sellers of these items than previously, with examples not selling as fast as they once did. For those who remember the Format International Security Printers’ saga of the 1980’s, parallels will no doubt be drawn. Royal Mail have finally confirmed, on the Post & Go news bit of their website, what we already suspected that The Royal Navy Submarine Museum at Gosport is getting Post & Go machine A004. They say that ‘Machine A004 will go live on Tuesday 28th July. The machine will vend Union Flag and Machin stamps with ‘The RNSM’ as the location identifier’. So yet another machine to collect or ignore depending on your stance.